This sheath for Paul Jarvis' award winning Persian short sword is by far the nicest I've ever made. 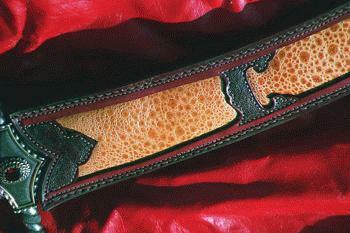 The four padded inlays (including the one behind the handle) are skins from the Malaysian horned frog. The detailing on the sheath duplicate the detailing in the gold and silver fittings on the sword. 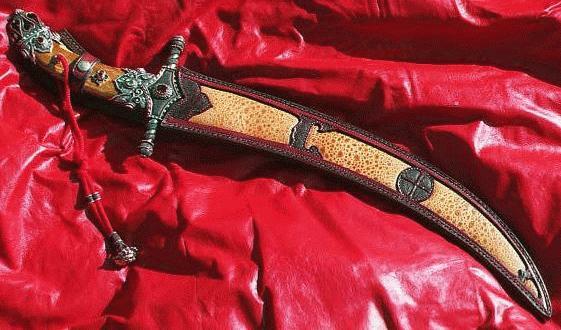 I am very proud to have been asked by Paul to make this sheath for his creation. Working with and for some of the world's greatest knife makers is certainly one of the fun parts of my job.